I only noticed this yesterday. 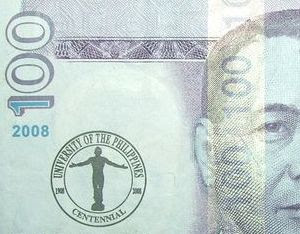 I had a 100 peso bill with me and it looked kinda different. It had an extra seal. Upon closer inspection, I found out that it was the UP Oblation statue with the text "University of the Philippines Centennial" in commemoration of UP founded in 1908.